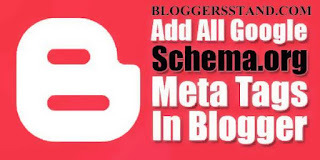 Google Schema Meta Tags For Blogger | BloggersStand ';-1!=b.indexOf("img.youtube.com")&&(a=' ');d=a+''+p+''+titlex+"
In this tutorial we are going to explain how to add Google Schema Meta Tags in blogger.Schema.org is a set of extensible schemas that enables webmasters to embed structured data on their web pages for use by search engines.Schema.org is a collaborative, community activity with a mission to create, maintain, and promote schemas for structured data on the Internet, on web pages, in email messages, and beyond.Schema.org is sponsored by Google, Microsoft, Yahoo and Yandex. Login into your Blog Go To Template Backup your template then Click Edit HTML. Now Click inside your Code Box and Press [CTRL+F] To Search </head>. Now Copy The Below Code And Paste It Before </head>. Save your template Done. !! change 104668009239235013090 with your google plus profile id. change115587840274121878323 with your google plus Official fan page. Replace image.jpg with your image url to show the image when there is no image in posts. How to check your Schema meta tags are working or not? After adding the above code in your blogger template you must have to check weather you added correct or not.Now open Google Structured Data Testing Tool that is also know as RichSnippet checker where you can view your Schema meta tags. 0 Comments on "Google Schema Meta Tags For Blogger" So Far - Post Yours!